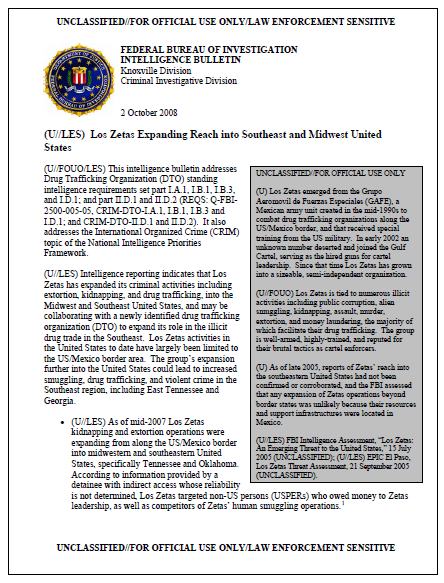 (U//FOUO/LES) LulzSec Release: FBI Los Zetas Expanding into Southeast, Midwest U.S.
(U//LES) Intelligence reporting indicates that Los Zetas has expanded its criminal activities including extortion, kidnapping, and drug trafficking, into the Midwest and Southeast United States, and may be collaborating with a newly identified drug trafficking organization (DTO) to expand its role in the illicit drug trade in the Southeast. Los Zetas activities in the United States to date have largely been limited to the US/Mexico border area. 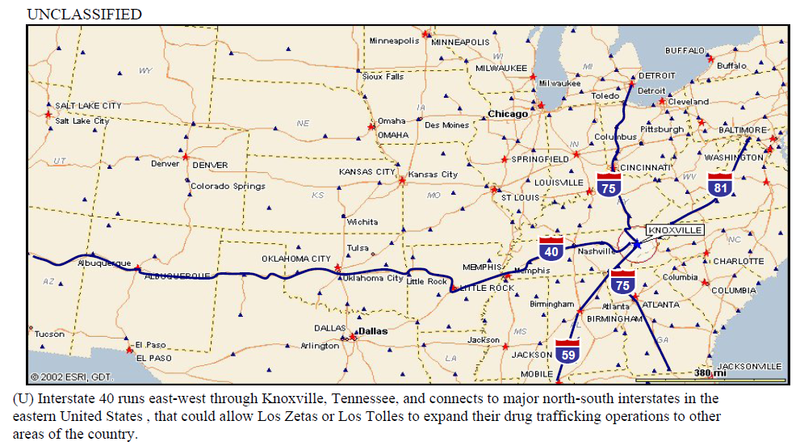 The group’s expansion further into the United States could lead to increased smuggling, drug trafficking, and violent crime in the Southeast region, including East Tennessee and Georgia. • (U//LES) As of mid-2007 Los Zetas kidnapping and extortion operations were expanding from along the US/Mexico border into midwestern and southeastern United States, specifically Tennessee and Oklahoma. According to information provided by a detainee with indirect access whose reliability is not determined, Los Zetas targeted non-US persons (USPERs) who owed money to Zetas leadership, as well as competitors of Zetas’ human smuggling operations. • (U//LES) The same source reported that Gaspar Gonzales Alcantar, a non-USPER, was a key Los Zetas leader and was involved in kidnapping and extortion operations in Oklahoma and Tennessee (NFI), and that Martin Moreno, a ‘Zeta 21,’ was also involved in the operations. Gonzales used a network of Zetas members and individuals who owed a debt to Zetas to extort money from victims in the United States. According to the same detainee, Gonzales fled to Mexico; the FBI has no information on his current location. • (U//LES) According to a source with excellent access, much of whose reporting has been corroborated over the last three years, a Zetas-associated individual, Jose Fuentes Anaya, was trafficking drugs from within the Bennettsville Federal Correctional Institution in South Carolina as of early 2008.i The source reported that Fuentes claimed Zetas was his sole drug supplier and could supply large amounts of cocaine or marijuana, delivered from Mexico to Texas then distributed anywhere in the United States. Although Fuentes acknowledged being ‘strongly associated’ with the Zetas, he claimed he was not a Zetas member. (U) Los Zetas may be collaborating with a newly identified DTO, the Acapulco-based Los Tolles organization, to increase its role in the southeastern US drug trade. FBI and local investigations to date have not corroborated intelligence reporting of ties between Los Zetas and Los Tolles in Mexico and Los Tolles drug trafficking networks in the United States. If accurate, however, these ties could facilitate expanded Los Zetas operations in the United States, and could lead to increased smuggling, drug trafficking, and violent crime in the Southeast region, including East Tennessee and Georgia.